The mysterious cache of exotic cars collected by the Sultan of Brunei has been hidden from public view for many years — until this week, when 21 popped up for sale for as much as $2 million. The worst news? The sultan never drove most of them. 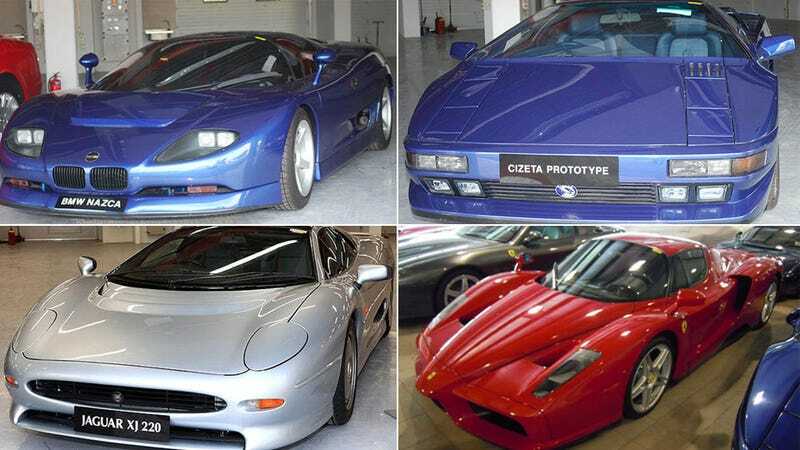 But the Sultan's neglect was so all-encompassing that many of them, including the Enzo, the Jaguar XJ220, the BMW Nazca V12 and the Cizeta V16 pictured above have the same mileage on their odometers that they left the factory with. That kind of car hoarding might appeal to a few collectors and museums, but here it's a tragedy. Not only did a wealthy despot waste his country's resources on toys no one enjoyed, there's no telling how much of their engines and suspensions have converted into a rust-and-oil cobbler. The world won't shed too many tears over a few Ferraris wasted, but many of these are a piece of history and deserve better than they've been treated so far. If someone with the proper resources wants to help us launch the Society for Prevention of Cruelty to Supercars, we're here to help. UPDATE: After our story ran, the seller updated the location of the cars from Brunei to New Zealand. They're that much closer to freedom.